momentary area of clear sun on their way to their critical mission to Tokyo. The Raider’s carrier task force (TF-16) was spotted by Japanese vessels well before they arrived at the intended departure point so the Raiders were forced to launch from the carrier "Hornet" earlier than planned. Fuel calculations now fell short of the planned amount needed for their destination, Chuchow, China. Their arrival in China would be at night, rather than during daylight as originally planned. Fortunately, sailors on the "Hornet" filled ten, five-gallon gas cans and passed them hand-to-hand to each aircraft, providing the fuel that made the difference between pitching at sea and coming down over land. 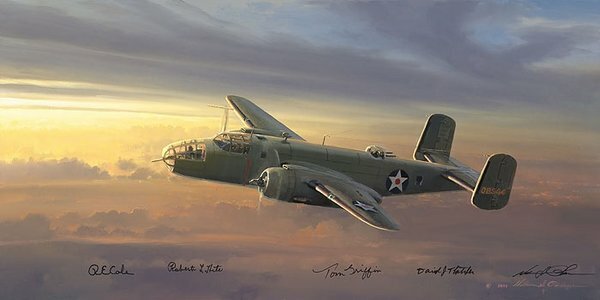 In this historical documentation on the Doolittle Raid, General Doolittle and his crew in aircraft 02344 break into a momentary area of clear sky. The last rays of sunlight bring only slight hope that they will survive their ordeal, as their fuel levels continue to fall and the hour of landfall is uncertain.